In the last post we talked about price. There’s a broad class of goods that either have no price, or that you can get for free whether they have prices or not. These include all digitized media goods. Most notoriously, these include music and videos, which can be uploaded and downloaded with little friction, even if doing so is illegal. This fact of early Internet life has presented an extreme challenge to “content” industries in general, and to the music industry in particular. You might say that the old container approach crashed, and most attempts since then on the industry side have consisted of creating new containers or raising costs to customers of violating the old ones — mostly by taking what the industry calls “pirates” to court. At ProjectVRM we have plans for the music business, but first we’d rather work with a smaller industry that welcomes our participation, that hasn’t lost business to freeloaders (because giving the goods away is what they’ve done all along) and that has been working with ProjectVRM from the start. That industry is public radio. The goods here are free for the taking but worth more than $0 — a claim substantiated by payments from listeners to stations for goods from NPR, PRI, American Public Media, PRX and other producers, as well as from the stations themselves. Business here isn’t bad. 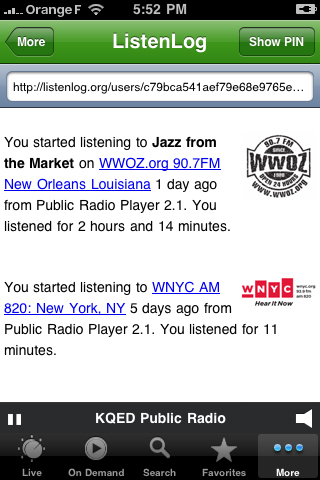 And public radio has embraced the Internet far more eagerly than most commercial content producers and distributors. Still, only about ten percent of listeners contribute, so there’s plenty of room for improvement. So the challenge we’ve given ourselves is raising that percentage, while also starting to model the free and open marketplace described above. With help from the Surdna Foundation (working through PRX and the Berkman Center) we began developing two VRM tools that put functionality behind r-buttons. The first is ListenLog. The second is EmanciPay. — along with ways to export and delete data. ListenLog is open source, and we’d love to see it used alongside other apps on other devices, and to model logging of all kinds of stuff (such as music). So far the Public Radio Player has had more than 2.5 million downloads, which means there’s some chance you already have it, if you’re an iPhone user. 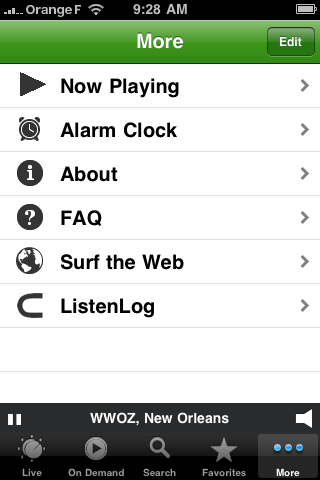 If you don’t, and you listen to public radio, get one, check out ListenLog and offer feedback and suggestions below. Or, if you’re an open source developer, help us out. Once you have the app, go into Settings, activate logging, and follow the results. You do that by clicking “more” on the bottom right tab of the Player, which goes to the page on the right. Below are three screen shots of my own logs. These bring up questions that EmanciPay can help answer. As logging applications go, this one is primitive. In fact, that’s one of the ideas behind it. We want others to take and improve on the ideas (and/or the code)_ behind it, and to put it to new uses. This is where EmanciPay comes in. That’s the subject of our next piece, the third in this series.